InTheBite would like to congratulate Captain Mat Bowman on the Northern Lights for landing the world’s largest blue marlin in 2015. 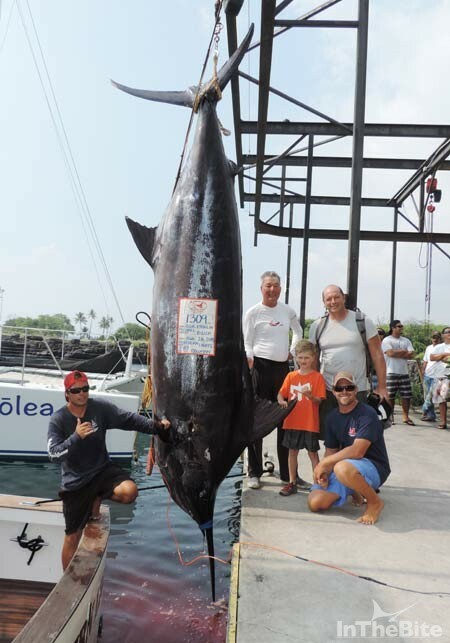 Catching a monster 1,309 pound blue off Kona, Hawaii last August gives him the honor of winning the InTheBite “Big Fish” Captain of the Year Cup award. The rules for this contest are simple: the “Big Fish” Cup gets presented to the captain who boats the single largest blue marlin during the calendar year worldwide. While Mat had close competition from Bryan Toney, another Kona captain, who landed a 1,305 pounder (women’s record) onboard the Harmattan off Ascension Island, Bowman takes home the honors by a narrow margin of four pounds. In review, August 2015 – Captain Bowman and crew Kyle Vannatta onboard the 37’ Merritt Northern Lights were fighting their third small blue of the day when they saw what they thought was a 700 pound blue following their teaser. Mat said “we knew it was big but not that big”. Mat kept the teaser and lure action going and with perfect timing, Kyle pulled the teaser away from the big girl and cranked down the long corner line, popped it from the rigger clip and reeled it in quickly to the hot and hungry fish. The 1,309-pounder grabbed a LG Koya Poi Dog and took off. Even with the big fish on, they still managed to get the smaller blue to the boat and release it. Angler Michael Bilich’s previous billfish experience was catching one of the smaller blues hooked earlier and then had on the fish of a lifetime. A quick learner, he managed to get the marlin to the boat in about two and a half hours. Worth noting: both Bowmen and Vannatta were working the deck on Northern Lights II when it caught a grander the week before. The fish also broke the tail stump rule- the girth of the tail stump was 19.5 – that predicts a weight of 950 pounds. A big congrats to all involved and especially Mat for catching the largest blue in the world in 2015! 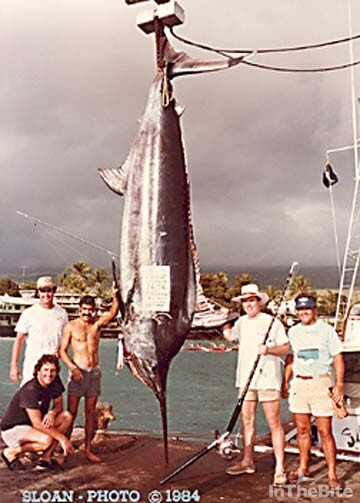 142 grander blue marlin have been recorded in Hawaiian state water since 1954. Capt. Bowman’s fish was the 12th largest in state history – hard to believe that there are eleven more blues bigger than 1,309 pounds in the same state. In 2015 alone, 7 grander blue marlin were caught in Hawaiian state waters, 5 in Kona, the last fish caught off Kona was the largest in the world. 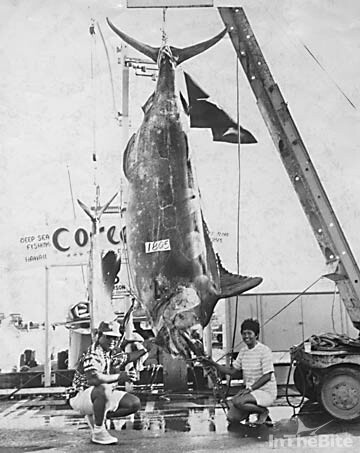 The largest blue marlin ever caught– a 1,805 pound monster on the legendary Coreene C off Oahu in June 1971. The three charter anglers were exhausted and seasick, crewwoman Gail Choy stepped up to the challenge and fought the beast the majority of the time with her father Cornelius Choy at the helm. 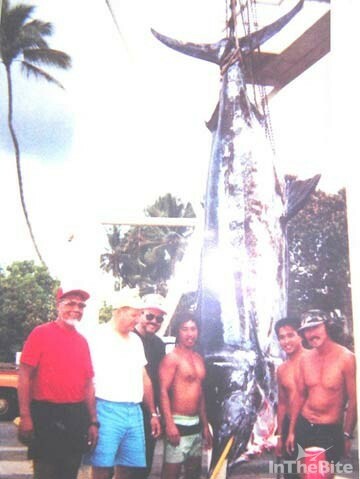 A gigantic 1,650 pound blue caught by a bunch of happy guys off Oahu aboard the Lucky Liz II with Capt. Alex Toki in March 1991. Worth noting: The forklift could not raise this fish completely off the ground to weigh and the captain didn’t want to cut it in half. The weight is estimated from measurements. A 1,649 pound behemoth caught onboard the Black Bart with Capt. Bart Miller off Kona in March 1984, appropriately it was hooked on a Bart Miller Torpedo Taper trolling lure.